The Melroys invite you to our rally in the Beautiful Northwest! Below is an image of the registration form for information only. Please download the PDF above for registration. It sure sounds like a fun rally!! Only wish that we could make it. Count us in! We can make the whopping 34 mile journey from home! Especially if Joe's cookin'. Sorry Jim that you and Pat can't make it, we will have a great time! Boomer.......of coarse Joe will be cooking! : ) That's what he does best! He loves to cook! Wow the timing could not have been better.I just put in for my vacation starting on the 5th and we were going to head over to visit our niece south of you in Newport. Now I think I will try and leave a day or two early and get to your Rally. Sounds like it will be a great time. We can't make that rally as we won't be heading to Vancouver, WA until after the rally in Cody! Darn it anyway! Oh course you know we will be there! Miss you already and it has only been a week since you left us! The last one was great! We will be there to enjoy this one too! Barb and Joe, I would be happy to help out with the rally if you need some help beings how I live so close to you. I am going to reply to this post to bring it to the top of the thread again. 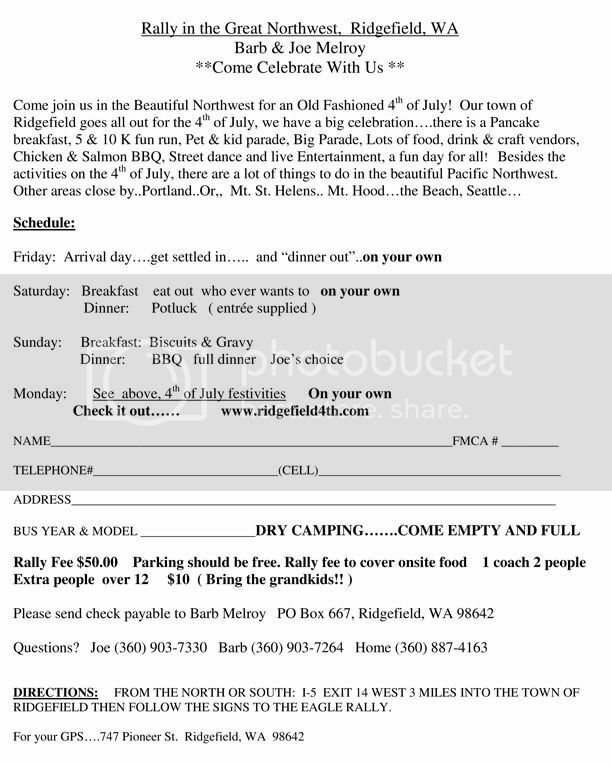 The registration form for the Melroy 4th of July Rally in Rigefield, WA has been added to the first post on this thread. Please visit the first thread print a copy of the registration form, fill it out and send it along with your check to Barb Melroy. We hope to see all of you at this wonderful 4th of July Eagle Rally.